You are browsing the archive for Antique Boat Museum. Free Admission to the Antique Boat Museum in Clayton, New York. 12th ANNUAL MUSEUM DAY LIVE! CLAYTON, New York (September 19, 2016) – The Antique Boat Museum (ABM), North America’s premier freshwater nautical museum, will once again open its doors free of charge on Saturday September 24, 2016, as part of Smithsonian magazine’s twelfth annual Museum Day Live! On this day only, participating museums across the United States emulate the spirit of the Smithsonian Institution’s Washington DC-based facilities, which offer free admission every day, and open their doors for free to those who download a Museum Day Live! ticket. Inclusive by design, the event represents Smithsonian’s commitment to make learning and the spread of knowledge accessible to everyone. Last year’s event drew over 200,000 participants, and this year’s event is expected to attract more museum-goers than ever before. The Museum Day Live! ticket is available for download at Smithsonian.com/museumday. Visitors who present the Museum Day Live! ticket will gain free entrance for two at participating venues on September 24, 2016. One ticket per household is permitted. For more information about Museum Day Live! 2016 and a full list of participating museums and cultural institutions, please visit Smithsonian.com/museumday. Located on the St. Lawrence River in upstate NY, the ABM features a collection of over 300 antique and classic boats, among thousands of recreational boating artifacts, including the famous runabout, Pardon Me, and a 113-year old gilded-age two-story houseboat, La Duchesse. In addition, the ABM plays host to the longest running antique boat show in North America and is considered the birthplace of antique raceboat regattas. The Museum will close for the 2016 season on Tuesday, October 11. For more information, please visit the Museum’s website at abm.org. 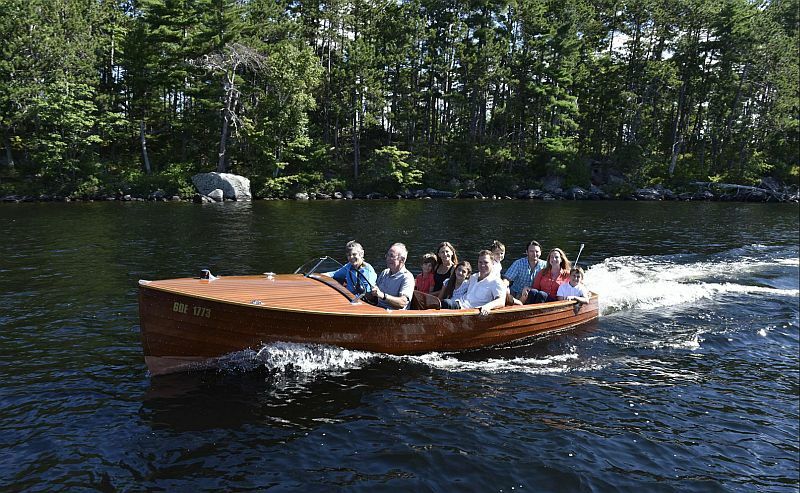 A Beautifully restored Duke Playmate is reborn on the Muskoka Lakes. 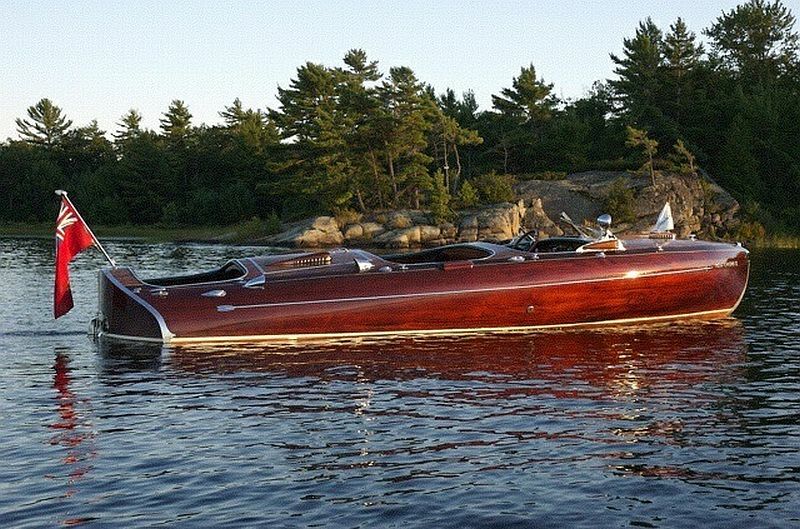 Congratulations to Gary G.on the newly completed restoration of his Duke Playmate, shown in the photo above. This project was a multi-year effort, involving substantial woodwork and engine repair. Playmates in their prime offered boaters a very practical, reasonably priced and efficient vessel for ferrying both cargo and passengers. Their small engines sip gasoline, yet they offer great passenger capacity, as demonstrated by Gary’s extended family in the photo. CLAYTON, New York (February 22, 2016) – The Antique Boat Museum (ABM), North America’s premier freshwater nautical museum based in Clayton, NY, announced today the details of the 2016 Antique & Classic Boat Society (ACBS) and ABM jointly hosted Symposium, a weekend full of in-depth and hands-on workshops, to be held May 13-15 at the Museum. In response to member demand, this year’s Symposium will offer workshops on repair techniques for vintage fiberglass boats, as well as basic restoration techniques in wood repair and finishing. Additionally, there will be sessions on getting the best performance from both inboard and outboard motors, marine castings and pattern making, and researching your boat. The weekend will also feature a presentation by Tony Mollica on the history of a local boat manufacturer, Fitzgerald & Lee, and its association with Gar Wood. Registration is only $199 ($225 after April 25) for adults and $100 ($110 after April 25) for youth under 18 years of age. Fees cover all lesson materials and select meals – Friday (dinner), Saturday (breakfast and lunch), and Sunday (breakfast). Online registration will open on Tuesday, March 1 at abm.org or contact ABM Educator Debra Rantanen at 315-686-4104 ext. 235. CLAYTON, New York (March 12, 2015) – The Antique Boat Museum (ABM), North America’s premier freshwater nautical museum based in Clayton, New York, announced today that the Caravan Stage Company will dock and perform at the Museum this coming August. The Caravan Stage Company (www.caravanstage.org) will float into the dock at the ABM this coming August 14 & 15 for two nights of high-flying, mesmerizing aerial acrobatics and a world-renowned theatrical performance that is sure to be the talk of the 1000 Islands this summer season. Since its founding in 1970, the Caravan has provided invaluable opportunities for young people from all sectors of their multi-faceted society and has traveled the globe reaching audiences of all walks of life. The Caravan embodies a long tradition of traveling theatrical productions with their combination of innovative stylistic staging, imaginative music and dance, and colorful entertaining themes. The shows are all original productions expressing the issues and concerns of people inhabiting the environment of the 21st century. One of the most unique aspects to this theatre is that all of the performances are done aboard a 100-foot long, 90-foot tall ship, which serves as their stage. The Clayton shows will be the only scheduled shows in Northern New York and on the United States side of the St. Lawrence River, making these shows more special and unique to the region. The Caravan performance known as ‘Hacked: the Treasure of the Empire’ integrates text, poetry, video, humor, music, movement, masks, props and special effects into a magical theatrical experience that is both compelling and inspirational. Tickets for the show are only $20 and can be ordered online at abm.org or by calling the ABM at 315-686-4104. In-person ticket purchases can be made when the Museum reopens on May 1. This event is lawn seating only and it is suggested to bring lawn chairs and/or blankets. The event is supported in part by Watertown Savings Bank, Bella’s of Clayton, Vintage Doors, and 7News/Fox28. ‘Hacked: the Treasure of the Empire’ plot revolves around the machinations of the Mammon trying to find the stolen treasure, the whereabouts known only to the Hackers. The Mammon must find it or else the Mammon Corp Regime will collapse. This original Caravan show explores the quest for freedom of expression, in political & social discourse, within the world of the internet & virtual media; examines the ubiquitous presence of surveillance in our lives; and probes the ethics of the dissolution of the public, democratic control over the justice and penal systems. ‘Hacked’ features the entire pallet of Caravan theatrical stereographic treats such as passionate characters, poetic lyrics, exotic and melodic music, multiple video screens with a global array of imagery and visual trickery, unique aerial acrobatics, surreal lighting and sound, and a giant mega puppet that spies, swags, savages, swears, swoons and sings. Located on the St. Lawrence River in upstate New York, the ABM features a collection of over 300 antique and classic boats, among thousands of recreational boating artifacts. The Museum is home to the world’s largest runabout of its kind and a 112-year old gilded-age two-story houseboat. In 2015, the ABM will host the 51st annual Antique Boat Show and Auction, the longest running such show in North America. For more information, please visit the Museum’s website at abm.org.